I’m a big fan of brunch. Give me a little hair of the dog with a decadent meal and I’m good as new after a night of celebrating. Many restaurants in Salt Lake City serve brunch, ranging from fancy-pants to utterly low-key. I opt for the latter. Tres Hombres Mexican Grill & Cantina is a mellow, laid-back place to enjoy brunch with a unique Mexican flair. This restaurant is a landmark in South Salt Lake, a venue for many family dinners and first dates since the mid-’80s. The interior is lush, filled with tropical plants with deep, private booths. Warm chips and fresh salsa appear faster than lightning. And drinks aren’t far behind. Take out the sting of a hangover with a house margarita or bloody mary for only $3.99 while you ponder the drink menu; there’s a lot to choose from. Tres Hombres has a huge tequila selection, with a top-shelf margarita menu that’s to die for. Try the Rose Angel, a lovely combination of Gran Centenario hibiscus-infused Reposado and Cointreau Orange Liqueur. For your meal, I’d suggest the Huevos Rancheros: fried eggs atop corn tortillas with black beans and Mexi potatoes covered in ranchero sauce and cheese. This dish will surely fix the ringing in your head. There’s also the layered enchiladas with corn tortillas, ground beef and beans, topped with two eggs, enchilada sauce and cheese. Omelets range from veggie-filled to the La Costa, which is stuffed with shrimp, crab and cheese and covered in ranchero sauce. If you’re opposed to eggs, Chef Mike will happily make you a custom plate; don’t be shy to ask. Vegetarian, vegan and gluten-free options are also available. 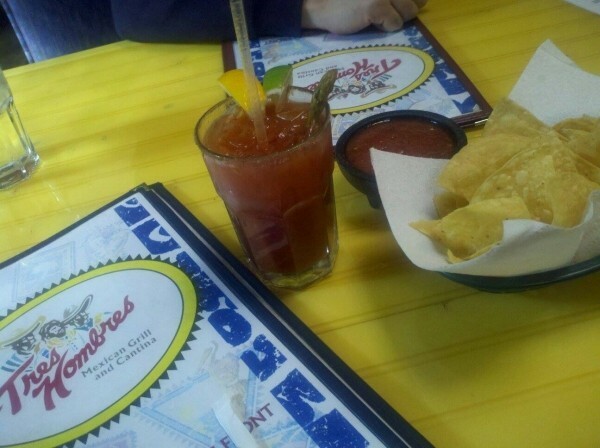 If you haven’t stopped by Tres Hombres lately, ready yourself for trademark generous portions, bottomless chips with housemade salsa and drinks aplenty—all the ingredients for the perfect brunch.